National Farmers Market Week is a celebration acknowledging our local farmers who ultimately are responsible for bringing fresh ingredients into our homes. The 2015 Fairfax County celebration which just concluded included lots of activities for families. An environmental education booth provided extensive information on the ways our market vendors help restore and protect the environment and their farmland. 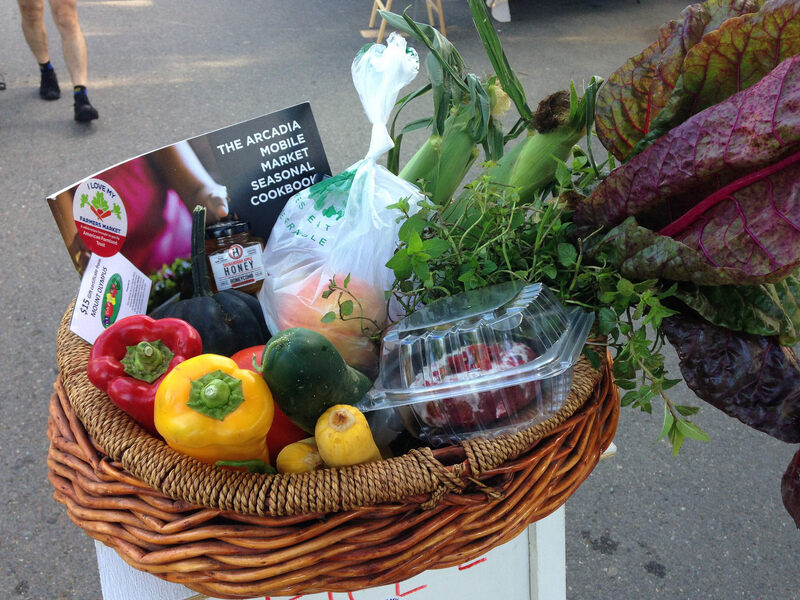 At each market a gift basket including vendor products, coupons, an Arcadia seasonal cookbook and a reusable tote was offered as a door prize. Recipients were thrilled and looking to return to market for more. Children enjoyed hula hoops and sidewalk chalk at each market, and they left the pavement decorated with multi-colored fruits, vegetables, and jumbled scribbles. 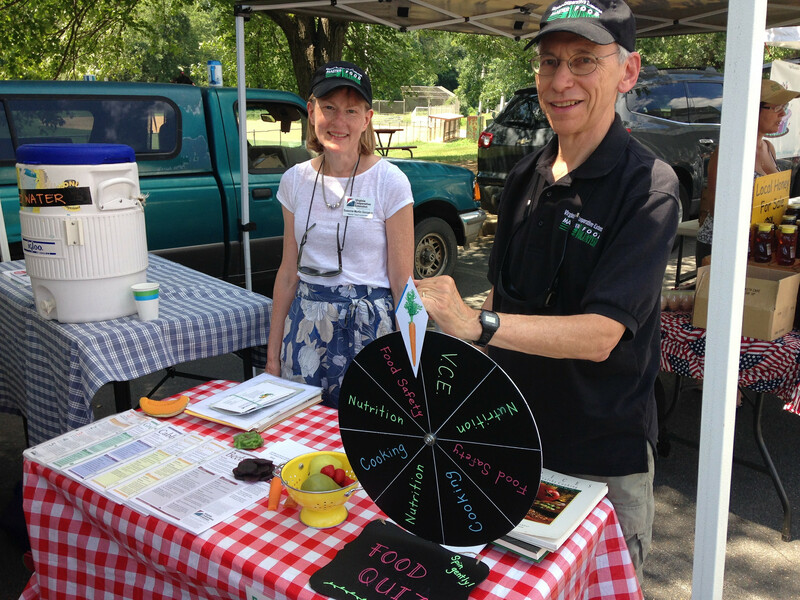 The Virginia Cooperative Extension’s Master Food volunteers delighted kids and adults alike with a food quiz wheel. After answering a trivia question correctly, winners were offered stickers and recipes for cooking fresh produce. At the Herndon market, children gathered for a watermelon seed spitting competition. With fresh watermelons from vendor Mount Olympus, a volunteer gave each of the kids a watermelon slice and carefully marked the farthest ejected seed. A cooking demo by Virginia Cooperative Extension’s intern Miriam Eackloff filled the market with mouth-watering aromas. One recipe featured cheesy kale and brown rice, a healthy and inexpensive item using seasonal ingredients. Her French toast with peach sauce was the perfect recipe for early morning market attendees. The free samples she offered disappeared in no time. Vendors were especially pleased with the increased foot traffic and festive atmosphere at each market. Bob Baldwin, Market Master at McLean, said National Farmers Market week brought the market some “new energy” in an educational and fun way. At the Farmers Market Week tent, customers completed a quick seven question survey to win a free “Buy Fresh Buy Local” reusable shopping bag. 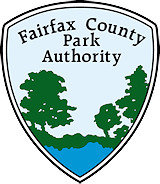 These surveys will provide valuable information that the Fairfax County Park Authority will use to improve the quality of all 11 markets. 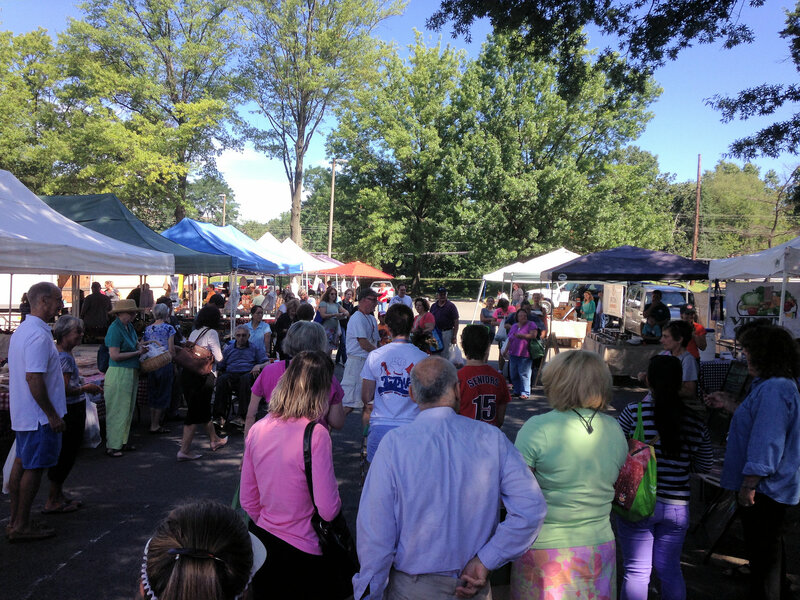 National Farmers Market Week at the FCPA Farmers Markets was a local success! Whether you are a seasoned market attendee or a newcomer, the market always offers a little something for everyone. This entry was posted in Uncategorized on September 8, 2015 by Fairfax County Park Authority.